When a catastrophic mobility altering event occurs, many people don't know who to turn to next. Many seek the services of a contractor or repair person. This solution typically ends with mixed results. We believe that no one should be taken advantage of due to the urgency of their need, nor should they receive an inferior solution or product. When possible, we work as a team with any physicians and/or medical related professionals who advise in your personal care to develop a design solution that will be tailored to meet your individual needs well into the future. From roll in showers to zero-step entries, chair/body lifts to integrated ramps, we design for seamless, integrated modifications that function perfectly and look beautiful. 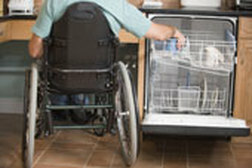 By utilizing strategic design modifications and Universal Design, many seniors and disabled individuals are completely capable of living their lives comfortably and independently in their own home. Access Design Group ensures that your Accessibility/Disability modifications are uniquely customized for your individual needs. experience and a thorough understanding of Universal Design principals.